The CITY Issue Vol. 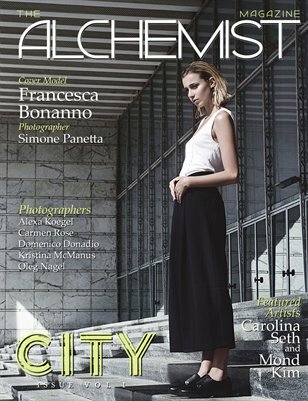 1 of The Alchemist Magazine features model Francesca Bonanno on the cover photographed by Simone Panetta. The issue also features photography editorials by: Alexa Koegel, Carmen Rose, Domenico Donadio, Kristina McManus, and Oleg Nagel. Featured Artists: Carolina Seth and Mond Kim. Back cover art by Mond Kim.